Reference electronically, print out your own copy or pick up a rack card at the Geneseo Welcome Center, inside Howard Hanna Real Estate at 81 Main Street! 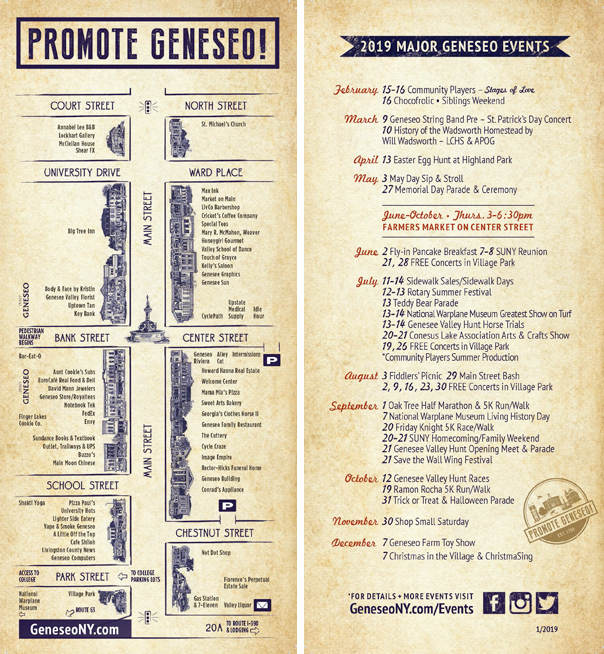 Note that many Geneseo businesses will also have the rack cards available. 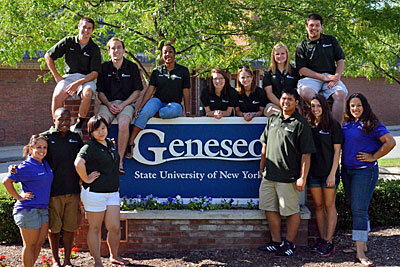 Select what you would like to do and we'll show you just some of the things you can do during your stay in Geneseo. Geneseo’s Parks and Conesus Lake welcome visitors and residents alike to enjoy a wide variety of land and water sports, and tranquil activities that range from picnics to enjoying the lovely scenery. 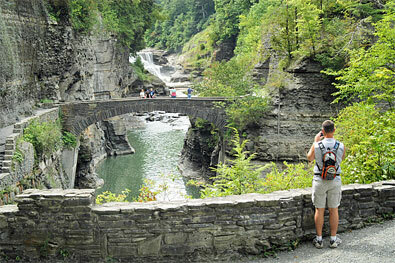 Minutes away one will find Letchworth State Park, a year-round gem featuring “the grand canyon of the east”, and Stony Brook State Park. Highland Park is located at 23 Highland Road at intersection with Oak Street. Facilities include: basketball and tennis courts, baseball diamonds, playgrounds, pavilions, fenced dog park, walking trail with workout stations and rest rooms. The Depot in Highland Park is the former Erie Railroad Depot, built in 1875 and moved to the park in 1976 from its original location at the foot of Court Street. It serves as a recreation building and meeting site for local organizations. Seasonal events in the park include a summer recreation program and winter ice skating (outside and weather dependent). Reservations for special usage of park facilities are made at the Village Office, 119 Main Street, Geneseo, NY 14454 / phone 585-243-1177 / Office hours 8:30 - 4:30 M-F. Village Park (a.k.a. 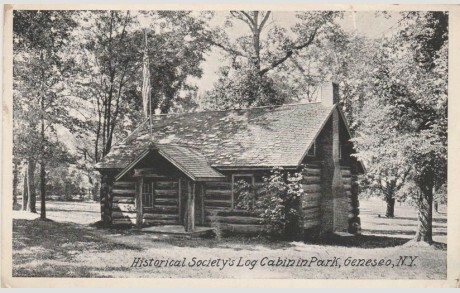 Log Cabin Park) is located on the corner of Main Street and Route 20A. Amenities include picnic tables, benches, rest rooms, gardens, extensive lawn, Veterans' Memorial, and historic Log Cabin. Click HERE for a history of the park. 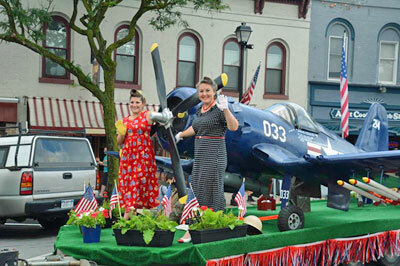 Traditional events in the park include Memorial Day Parade line-up and program; Geneseo Rotary Summer Festival; the Summer Concert Series; and gathering spot for the annual Halloween Parade and ChristmaSing. Gateway Corner Park at Volunteer Road provides a “Geneseo Welcomes You” sign at the eastern gateway to the area and features picnic tables, a drive-in area, a memorial plaque in tribute to the nameless individuals buried in the neighboring County graveyard, a Blue Star Memorial By-Way Marker and flag honoring the Armed Forces of America. Across Volunteer Road is a Community Sign Garden. Long Point Park. on Conesus Lake is a seasonal park, located on Route 256 (West Lake Road) at the intersection with Long Point Road. Facilities include: picnic tables, barbeque equipment, large pavilion (available for rent), restrooms, playground, gazebos and gardens with extensive lawn, beach and public dock. Lifeguards have scheduled hours during the summer. Traditional events in the park include Cops for Kids Day, 3rd of July Ring of Fire, Conesus Lake Association Arts & Crafts Festival and the Fiddlers Picnic. Reservations for special usage of park facilities are made at the Town Office, 4630 Millennium Drive, Geneseo, NY 14454 / phone 585-991-5000 / Office hours 8:30 - 4:30 M-F. Town parks are carry in / carry out. Roemer Arboretum, was founded in 1990 through an endowed gift to the SUNY Geneseo Foundation by Dr. Spencer J. Roemer, Emeritus. The Arboretum is dedicated to the integration of research, education, and the appreciation of nature. It consists of 20 acres, located on the south end of the SUNY Geneseo campus, bordered to the west by Route 63 and to the east by Routes 20A/39. It can be reached through the south entry of campus from Route 20A/39. The Arboretum is open, free of charge, from dawn to dusk. Visitors are encouraged to walk along the paths, admire the beauty of the Genesee Valley, inspect the variety of trees and plants, relax and enjoy the view from the gazebo and benches. Groups of 10 or more individuals who would like a guided tour of the Arboretum should call (585) 245-5442. Free parking for the public is permitted in Lot J north of the Arboretum during the summer following Commencement (mid May) until student move-in day (late August). During the academic year, parking is allowed in Lot J after 4 pm and on weekends. At other times during weekdays in the academic year, visitors may obtain a visitor’s parking permit from the Parking Services Office in Schrader Hall Room 19 (open 8am - 4pm). Located at 4180 Lakeville Road (Route 20A), it features first run movies in 6 theaters. For schedule, check web site or call 585-243-2691. Located in Mumford, only 30 minutes from Geneseo via Route 39 north, 5 west, and 36 north. Sixty-eight historic buildings for family viewing and a host of family activities week ends year round. The Nature Center (175 acres with five miles of hiking trails) offers walks and programs for all ages all year, such as Breakfast with the Birds and Insects in Winter. Enjoy, for example, the fall Agricultural Fair (children and adults contests), apple cooking demonstrations, Fourth of July celebration, and base ball games using 19th century rules and uniforms. Call 585-538-6822. Located at 4376 East Groveland Road, Geneseo. The Center seeks to teach children and others about agriculture and our food system. It is a farm that educates and excites children about the conservation of natural resources and the use of modern farming advancements to grow crops, raise livestock and protect the environment. a.k.a. "The Riv" - This facility, formerly known as The Rex, then Riviera Theater after 1930, has had a long history of movies and community involvement in Geneseo, dating back to the early 1900’s. After a 20-year hiatus, Palace Properties purchased and restored the theater to a multi-use performing arts center, featuring classic and new films, concerts, lectures, small theater productions and receptions. Check the website for the latest schedule. Enjoying the fun of locating geocaches in the Village and Town of Geneseo will take people of all ages to a variety of places: from Long Point Park at Conesus Lake to historic sites in the Village to the College campus and places in between. Located at 4262 Lakeville Road (Route 20A). Has 16 lanes, a restaurant/pub and OTB EasyBet. 585 243-1760. Located at the corner of Routes 20A and 256. Miniature golf, go-karts and batting cages. Also has a mini-discovery zone for younger children and a popular area restaurant. Call 585-346-6167. Located on Route 15 just north of Routes 5 & 20. Open April – October. For schedule see web site or call 585-226-9290. Renowned as the "Grand Canyon of the East," is one of the most scenically magnificent areas in the eastern U.S. The Genesee River roars through the gorge over three major waterfalls between cliffs--as high as 600 feet in some places--surrounded by lush forests. Located only 6 miles from Geneseo. Take Route 39 south; turn left onto Route 36; watch for sign on right. Geneseo is the home of SUNY Geneseo, one of the most highly regarded public colleges in the Northeast. Geneseo hosts many festivals and events to delight visitors and residents of all ages and interests. Follow the events throughout the year as listed below. Memorial Day Parade - The parade travels along Main Street from Village Park to Civil War Monument and then returns to the Village Park for a ceremony. Geneseo Summer Concerts - Join us on Friday evenings in the Village Park for a variety of quality music - everything from jazz, Celtic, big band, good ol' rock & roll, country, blues and standards. Just bring your family, friends, and a chair. What could be sweeter on a summer evening? Conesus Lake Ring of Fire - Held annually on July 3rd. Lake homeowners light up the lake for holiday celebrations. The Geneseo Summer Festival is an annual event the 2nd week of July. The festival amongst other things include the Teddy Bear Parade on Saturday, games and crafts for children, sidewalk sales, vendors, concerts, and refreshments provided by local churches. Geneseo Air Show - The Greatest Show on Turf. Six hours of non-stop flying demonstrations of World War II planes for 2 days. See vintage planes up close and talk with pilots. Visit the National Warplane Museum, which is also located at the Geneseo Airfield. Second weekend of July. Fiddlers’ Picnic - Held annually at Long Point Park on Conesus Lake. Multiple stages highlight old time country music. Off stage jam sessions encouraged. Fiddlers of all ages are invited. Takes place in August Free admission and parking. Oak Tree Half Marathon & 5K Road Race; Kids Fun Run - Sponsored by the Genesee Valley Conservancy, this race takes participants through historic Geneseo village streets and surrounding rustic roadways. Held Labor Day weekend. Opening Meet of the Genesee Valley Hunt Club - The oldest Hunt Club in the country. Hounds precede the formally dressed Hunt Club members on horseback as they proceed down historic Main Street at 7:30 am on the last Saturday of September. Genesee Valley Hunt Races - Pony, steeple, and flat races. Stick horse races, wagon rides, and mingling with the Hunt hounds for children. Terrier competitions, tailgate picnics, vendors. Nations Road, off Route 39. Saturday of Columbus weekend. Small charge for entry. Halloween Parade - Children gather at Village Park and parade down Main Street to the Bear Fountain. Prizes and refreshments. Christmas Sing - Everyone assembles at the Village Park to see the lighting of the Christmas trees. Caroling, led by Rotary members, begins at the Park and continues as the group strolls down Main Street to the Bear Fountain. Trees in the Fountain are trimmed by Geneseo Garden Club members and SUNY students with Christmas decorations made by the kindergarten and third graders of Geneseo. Everyone gathers around the Fountain singing carols before Santa Claus arrives. Each child has a chance to meet Santa and everyone enjoys free refreshments. Eagle Crest Vineyards located on Hemlock Lake at 7107 Vineyard Road in Conesus, NY. Call 585-346-2321. The weblinks below offer more general information about Finger Lakes Wines and Wineries.